How ironic that Simplicity is now selling print BurdaStyle patterns on their website! Thanks for the heads up. 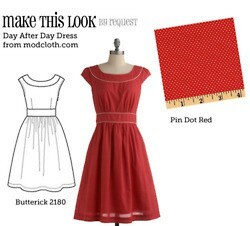 The only downloadable sewing patterns I’ve used are Hot Patterns offered free on fabric.com. BurdaStyle and Simplicity are owned by the same company. So it Butterick. I didn’t know this until we started stocking Simplicity patterns in Mum’s shop. I bear a grudge against Simplicity because they allow the retailers almost no profit. Actually, the costs almost broke our little shop. The contract rules have everything in Simplicity’s favour, and nothing for the retailer. I hate having to tape everything together so I normally, on the rare occasion I do print at home versions of patterns, take the file to kinkos for the print at the copy shop option. I also refuse to pay non indie pattern companies more than the 1.99 sale price. I think it’s pretty funny that the print at home version is the same cost for simplicity as the paper version. How does that make any sense? I’ve used PrintSew – this is what I do. I installed the free PDF printer ‘PrimoPDF’ onto my laptop – basically your PC thinks that PrimoPDF (http://www.primopdf.com/) is a real live printer-machine, but instead of churning out paper, it creates a PDF file for you (I tell it to send the files to the Desktop, where I can find them easily + move them to wherever I want). The PrimoPDF way doesn’t seem to be working for me…unless I’m setting it up wrong. They must’ve changed the security on the files. Claire- I thought what a great idea, and downloaded primopdf. But all I get is “Invalid printer selected. Printing to this device is not allowed.” I had no idea I get to use it only 3 times. I have already “used it twice” just from experimental downloading and not printing. I had wanted to make a jacket for me and another for my aunt. I also expected the software would give me some other options, like making the pattern a bit shorter, So I don’t have to cut and measure and tack the paper pieces. The price is definantely not the value of getting to print 3 times!!! Another great PDF printer is pdf995. I haven’t tried printable patterns and I can’t imagine liking them, for the reason Paige said – having to tape everything together. I do like tissue paper patterns but I also like Kwik Sew, which are printed on thicker paper. Last year I wrote a post about all the websites I knew that offered patterns for download. Some of them are free of charge, while the others are pay for. Here’s the list. I try to update it whenever I find new links. I can’t be doing with the faffing involved in downloading patterns. Then printing. Then taping. Then cutting the pattern pieces. And if you want to store the pieces on tissue paper rather than printing paper (which takes up 4x the storage space), you then have the extra stage of transferring them over and cutting some more… You may get instant gratification of purchase but there’s nothing instant thereafter. One of the many reasons I like vintage patterns is that they mostly arrive cut already or non printed, with pieces that require nothing other than tracing away onto the fabric (or muslin, if I’m really pulling out the stops). I don’t think I’ll ever use BurdaStyle for that very reason. I lost interest in Simplicity’s downloadable patterns when I saw they charge an additional 20% for people outside the US. This is the internet, Simplicity. It does not cost you more to send a digital product to another continent. This is the worst possible implementation of something you can buy online I’ve seen in a while. The big pattern companies are lucky sewing isn’t mainstream – with this sort of implementation, they would be riddled with piracy if it were, just like movie companies. It’s just another case of companies being late to the game and not understanding that people will buy their stuff if you make it easy for them to do so. Cheap and DRM-free will sell way more than expensive and DRMed. Gah. So annoying, I just don’t understand how they have sales people missing the basic point of INTERNET sales. I’ve done a few downloadable patterns and it’s just not my thing. I hate fiddling with the paper and tape. Cutting is my least favorite part of sewing, so I’d rather have it already all laid out for me on a big sheet. Downloading seems such a drudge in the first place! *Vintage* are cost effective, with infinite creative possibilities. Why use someone else’s idea of modernizing the vintage when your own scissors can create a beauty for your closet? More than that, I’m grateful to you for the heads up–I will not be bothering with Simplicity’s “downloadable” patterns. Tissue paper patterns are relatively cheap, especially when you get them on sale. Print-them-myself patterns cost me paper, tape, printer ink, aggravation and paper cuts. I have to REALLY want a downloadable pattern, and it has to be COMPLETELY unavailable in a similar style at the fabric store. Oh, and tissue patterns usually come with suggestions for fabric layout and instructions for construction that have been proofread, and that I don’t have to also print out myself. So, tissue for me, please. I ordered a few from the McCall’s line–two on clearance, one regular price (club member’s price) late Sunday night. I realized just after placing the order that I had ordered the full-price one in the wrong size. Customer service was not open until the next morning. I called first thing in the morning my time (two hour difference) and inquired. They insisted the order was already processed and could not be changed, but once I received the pattern I could send it back with a money order for $4 shipping and have it exchanged for the correct size. I then totalled it up–$6 for the money order from Canada Post, $4 shipping, and about $2.50 to ship it back. I might as well just buy the pattern again in the correct size–it would cost me the same. Up until then, I’m not too bugged about it. I should have checked before finalizing the order. What DOES burn me is receiving the e-mail THURSDAY MORNING that my order has been shipped. The order that on MONDAY MORNING they couldn’t possibly change because it was already being processed. I’ll still deal with them, but I would warn everyone to be very careful when ordering. I ordered a downloadable Simplicity pattern (I’m in the UK) and it took them A WEEK just to send me the Printsew link. Paper patterns I’d ordered from Vogue/Butterick/McCalls at the same time arrived faster. I was NOT impressed. I haven’t even tried to print it, and, generally speaking, with the cost of printer ink I don’t think I will bother with printable patterns much in the future. I must say, I have been really pleasantly surprised by the the B/M/Vogue website – wait for the sales and the patterns are massively cheaper than they are here in the UK (where we don’t have JoAnns or anywhere that sells patterns at a discount), and they ship really quickly. I may be the odd gal out..but I love the Simplicity patterns…the ones you find at Hancock or Jo-Ann Fabrics. They seem to fit me (especially at the shoulders) with few mods. I like the idea of downloadable patterns but I confess I still use tissue. I don’t have a printer at home and so I’d have to take downloadables to the copy shop. Perhaps if I didn’t have a Burda subscription already I might do it. I completely agree with you about the DRM. It’s no protection for Simplicity and a real pain in the neck for the consumer. I won’t use a pattern that requires me to print it, tape it, cut it, etc. No thanks. I make a list of stuff I want from their website, and when I’m in the mood I stalk sales and shop away when they are 1.99 or .99. I barely even use 1/4 of the patterns I buy anyway (eyes way bigger than time in this case). I just read the announcement about Simplicity selling BurdaStyle patterns too, and I just hope it’s not as kaffufly as the process for their own stuff. What a headache! I agree with Claire (aka Seemane), 3rd comment, about using PrimoPDF. I’ve been using that on my laptop for over a year and love it. It’s so easy to use. I’m not sure if this applies, but on a Mac you can save a PDF from any Print dialog box. When it pops up to select printer, etc. just look over in the lower left hand corner. I love the tissue paper patterns. I think I’m just nostalgic. I like the sound the tissue makes and the feel. It makes me think of my mother sewing when I was a little girl. Since patterns are sold in multi-sizes, I still trace them off on pattern fabric. It isn’t much more work than printing and cutting and taping would be. So, chalk my love of tissue up to good ol’ nostalgia. What a crock. Why bother then. There’s way too much competition now. Thank you for this post. Yes indeedy-do. I’ve bitched (sorry but this gets me really mad) about these very points on BurdaStyle forums before. I really do hate PrintSew for the reasons you’ve listed and more. One main beef I have with them is that if you want to save your “expensive” home printer ink and say, print the pdf file more cheaply at a print store or the public library you can’t because these places won’t let you download the program required to print these documents (it is against their policy because of fear of viruses – and fair enough too) so you can’t. Also – the pattern layout is very poor – it is almost if they have designed it to use as much paper and ink as possible. For example – say you want a size 12 – it will give the other sizes printed as separate pieces on separate pages so you print off a lot more than you really need – and considering some of the patterns go up to a size 22 that is a lot of waste (and it is really tricky to identify the pages you actually do need to avoid printing ones you don’t). The whole thing is a crock and I refuse to use them!!!! Go team BurdaStyle – they are a model for how things should be done! Ugh, how irritating! I’ve never even been on the Simplicity web site, but I LOOOOVE browsing BurdaStyle. They have so many cute patterns, and even a ton of free ones that I love to download and experiment with. Thanks for the honest review – it’s good to know that Simplicity online isn’t worth messing with! I love Burdastyle and being able to download patterns! I’ve only just started sewing, and I absolutely love that if there’s a pattern I maybe like the look of, I can click on “finished projects” and see aaalll the variations made by other people, with different fabrics, for different body shapes, different necklines, hems, etc. VERY handy for a newbie to see how things 1) can be tweaked, and, 2) look on a real human, as opposed to the gorgeous, but totally unrealistic pattern sketches. The sticky-taping up of the print out *is* extremely tiresome, but I do like the sturdiness of paper as opposed to tissue. And I’m currently too slack to trace the pattern onto something (I just cut immediately), so I love being able to re-print whenever I like, eg, to make again for a smaller friend. Thanks for this post, Erin! Everything about the post and the comments has been interesting and helpful to me. I haven’t tried downloadable patterns (except for a few craft freebies) and I found the remarks from other sewers very interesting. Also, I hadn’t known about Sew Weekly, much less the Make This Look feature–so now I have a new site to bookmark, as well as useful information and lively, helpful discussion. This blog and its readers are the best! Thanks again!! I’m sorry your experience was so unpleasant (I’m not a fan of clothing pattern downloads myself, even from Burda– too much work involved, what with all that taping) but at least your post brought a delightful dress pattern to my attention. 🙂 Hancock had Simplicity on sale for $1 so I ran out yesterday and got one in my size. I’ve already pulled out fabric from my stash and can’t wait to get started! I can’t imagine downloading a person-sized sewing pattern and printing and assembling it myself. I loathe the way computer paper wrinkles when you pin it, and it’s near impossible to fold it up neatly once it’s been taped. I just wait for the 99 cent sales or, more likely, buy vintage. Ironically, I use almost nothing but PDF patterns for my doll sewing biz – but that’s because doll clothes pattern pieces are so small, there is little or no taping (and it’s such a niche market online is the only way to go). Even then, I will trace them onto interfacing or something because I hate pinning computer paper. I could not agree with you more on Printsew! I live in Barbados so was hoping that this would have been easier than waiting for patterns to be delivered. Using PrimoPDF didn’t work for me either, so I’m not bothering again. Its not worth it. Thank you for your helpful post. I found it after googling an issue I had with setting up the PrintSew FileOpen plugin. The PrintSew setup is really from the dark ages of the internet. I finally figured out that I had to select size and paper format before the request to install the plugin was no longer displayed and the pattern opened. On the other hand the PrintSew customer support was very friendly (they answered my help ticket within minutes and simply supplied me with a working link). Another thing to consider: They link your account to a specific computer, which is very annoying if you need to print it from another one, e.g. at a friend’s place workplace if you do not own a printer. If you want another computer authorized you need to contact customer service. I always buy the Burda magazines, then the patterns are even cheaper 🙂 But occasionally I also use their download and as you say, it’s so easy and works perfectly – go Burda! That’s shocking bad customer service. No need for that rigmarole. I use burdastyle and, yea, it’s fiddly but here, in Ireland you are paying the equivalent of $15 for a basic paper pattern and they are NEVER on sale of available in charity shops so I can get about 4-5 burda patterns for the price of 1 shop bought pattern. Here in France I can buy the Burda magazine, and since it’s only 6 euros (with the paper patterns, heavier than tissue), I go that route when an issue has patterns I like. But. I’ve found their skirts to be seriously wonky, to the point where I won’t make them any more. I visit the big-name patternmaker websites all the time for inspiration after seeing looks I like in stores. I only buy from them on sale, though, and like you say they do it pretty often. I finally got a couple designer patterns recently (on sale too! $30 at regular price, yeesh), and have to say they are really nice. Their directions give accurate couture techniques, which impressed me. Long story short, their tissue patterns have always been worth it – I’ve never had problems with them like I have with Burda ones. Just today I took apart the last wonky Burda skirt I’ll ever make, and re-cut it to a McCall’s pattern that turned out beautifully. I do wish they’d use more normally-sized women as models, but on Facebook they’re pretty awesome about sharing people’s projects in all sizes. Worlds better than Burda, who always seem to showcase tiny women. Burda dresses and trousers can really be great though! Still wearing some Burda capris I made years ago. I have bought about12 patterns through print sew. I wasn’t aware of the limits on printing but suspected there might be. I do get tired of the printing and taping, and then add to taht I copy the size pattern I want onto tracing vellum So I am not cutting up my original. Talk about alot of work. I an’t stand using my printer paper for cutting from. it just doesn’t sit right on teh fabric for a nice cut. Thanks for your info though. First I have stumbled across. I’ve done a couple of print at home patterns (actually sewed them up, I mean), and have some BurdaStyle downloaded and ready but haven’t printed them yet. I really hate the taping together part. I dislike heavy paper for patterns too (I know I’m in the minority) and prefer the feel of tissue. I mostly sew with vintage patterns these days or if I’m going modern, with Burda’s magazine patterns. Thanks for the post! I wish I read this before I purchased the patterns from simplicity.com. They really make it impossible to print out the stuff I paid for. I don’t have a printer at home. The public computer at Staples doesn’t allow me to download anything plugins for security reasons. And I still have no clue how I can print this out … I know one thing for sure, I will not buy any printables from simplicity until they change their printsew site. First upload your measurements, then pick your pattern, “Smart Pattern Co.” sends electronic file of pattern adjusted to your perfect measurements to your local Kinko’s and you run over and pick it up, or receive it in the mail next day. There was a company doing this for a while, but i guess demand was low and they went out of business, plus they were doing the print & tape and trace thing. Even better if Kinko’s could print on tissue but that may be hoping for too much. Since the measurements are so specific, there would be less reason for piracy. I would be a customer for life. Hello! 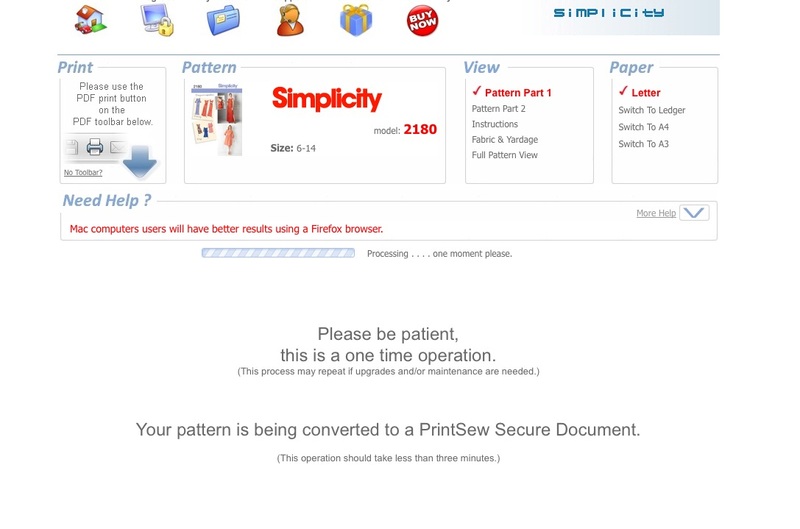 I have just today bought a pattern from simplicity.com and it don´t work, I have installed the plu-in and adove reader as standardized program for pdf format to reader but it dont work, I don´t recommend this website to anyone. This happened to me too!!! So awful and so frustrated! But now I guess I’ll try the burda website! I wish I had read this before buying patterns at print sew. I can’t even figure out what the error message means when I try to download the plugin, and I have a feeling they’re flat out going to steal my money. And yes, Burda is the greatest. Especially disappointing when I have already used up 2 of my 3 print allowances just messing around trying to find out how it works. I also had some idea the software would allow me to make alterations before printing. Will not be purchasing this again! I just bought a pattern as well, the rigmarole you have to go to just to download the pattern, compared to other sites, its just not worth it. Then when I did print it out, the writing is so small I cant even read it. It doesn’t tell you how much material you need. it just shows the photo of the bag. I think I might try and get a refund. I wish I had read all the posts before purchasing and agonising over the simple idea of printing a pattern. I am going to call them and try to get my $ back. I will not use PrintSew, they bilked me for a pattern that was downloadable for any reason. I did load two others, but one would not. I sent more than one request for assistance, never heard from them. No second chances from me.